The Greater Toronto and Hamilton Area (GTHA) is a connected urban region composed of some of the largest cities and metropolitan areas in Ontario. Combined, the GTHA holds a staggering population of approximately 6.5 million, which reflects 18% of the population of Canada and 50% of Ontario. With this mass density in the GTHA comes road congestion. Congestion in the GTHA is most severe during weekday commuting periods in the morning and evening. 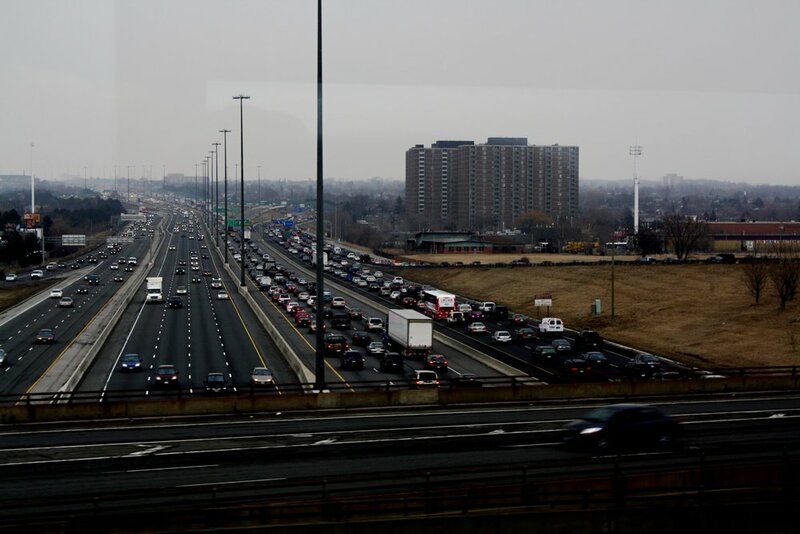 The Toronto Board of Trade refer to Toronto traffic congestion as the worst in North America and expects that the GTA itself will grow by 3 million more people and 1.5 million more vehicles by 2031. The annual cost of congestion in the GTHA exceeds $6 billion, broken down to approximately $3.3 billion to commuters and $2.7 billion to the economy. Annual costs include social, economic and environmental effects associated with the commuter and the economy. Roads are a common pool resource. They are sufficiently large enough that it is difficult, but not impossible, to define and exclude user’s overall. Each individual’s use of common pool resources subtracts benefit that other users might enjoy, which could be less congestion or decreased travel times. As a relatively open access resource, roads are likely to be overwhelmed in a market. If growth in the GTHA were to continue at the current rate, with no intervention, congestion will only get worse and continue to negatively affect the economic, social and environmental pillars in society. Before addressing the social, economic and environmental effects of congestion, it is important to mention the economically efficient level of congestion. A certain level of congestion is considered healthy as it illustrates, for example, flourishing business activity and society’s involvement in activities. Society will be worse off when congestion encroaches beyond a certain tipping point and the cost of congestion exceeds the underlying benefits. No congestion, essentially free-flow travel, is not an ideal scenario as it produces precarious consequences. Transportation is a derived demand, meaning individuals choose to make a trip because they value the anticipated activity at the end point. This can include, but not be limited to, shopping, visiting a friend, and going to and from work. This shows how society values a trip if the benefits derived from making the trip exceed the cost of the trip. This shows how congestion is the result of a market failure. Within a normal market for commodities, prices will essentially follow, keeping in mind the invisible hand model, to organize supply and demand and further enable the decision-making of society in order to coordinate an efficient allocation of resources. Applying this to the transportation market proves to be false. Failure in the transportation market comes from the inefficiency in how the decisions of individuals interact to affect society’s wellbeing. When making a trip, individuals contemplate the benefit that they will acquire and the costs they will sustain. However, when making travel decisions individuals disregard the delay that their presence on the road causes other motorists. If road users took appropriate account of their effect and actions the level of congestion would be economically efficient and anything above this level would be considered excess traffic. Congestion can affect society socially, economically and environmentally. Social costs include excess time delay, increased vehicle operating costs, productivity loss and accidents. Economic costs include loss of productivity and infrastructure maintenance cost. There is a result of higher costs of business activity from the increase in transportation costs and the adverse labour market impacts. Higher transportation costs are recognized in higher wages and decreased demand for labour, leading to an insufficient distribution of labour resources. This results in an indirect cost on the economy. Environmental costs include vehicle emissions, environmental degradation and wasted energy. Vehicle emissions increase with congestion and the overall sum of emissions is inadequately large in part because of the excess traffic volume. These environmental costs can impact the health of individuals, our environment, wildlife and vegetation. One of the most important factors is the effect of excess emissions on the environment, where profound impacts include the loss and harming of valuable ecosystem services. Ecosystem services are benefits that humans obtain from ecosystems and are often either very difficult, costly or impossible to replicate. Given the current dynamics of the GTHA and projected growth, it is important to alleviate road congestion to ensure economic efficiency. Choosing to ignore the issue of road congestion would prove to be inefficient and continue to encourage the ever-growing social, economic and environmental consequences.